I started this particular post just before Christmas and scrapped it several times before giving up altogether. 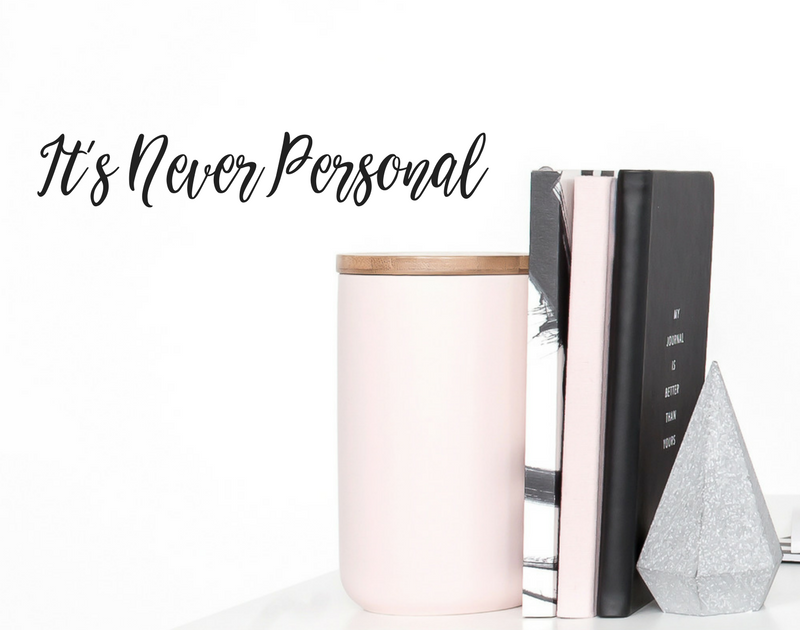 ‘It’s Never Personal’ became way too personal and as such, too difficult to articulate. As much as I seem to have found a new passion in writing and blogging, I haven’t always been the most articulate of folk, and often find myself stuttering, and stumbling over words, struggling to express myself clearly, especially when engaged in high emotion. I can preach and lecture all day long in the most eloquent streams of affirmation and inspiration, but ask me to take on my other half, or a family member, in an argument and I’ll always lose. Every single time. Not because I’m always wrong (I sometimes can be and I’m OK with that) but always because I take it so personally and I let my emotions get the better of me. They’re a funny thing, these “emotions”. We’re told there’s a whole spectrum of them, and we learn all the ‘labels’ in pre-school as we’re learning to read… happy, sad, angry and scared seem to be the ones that leap out from my memory of nursery books. Funny how three of those are ‘negative’. What exactly are we filling our children’s heads with? Probably a topic for discussion another time. My experience shows me that our emotions are heightened when engaged with other people. It doesn’t take a rocket scientist to know that much, but what perhaps we aren’t aware of often enough is what these emotions are and why we project them on to others. Whilst our emotions can change in response to an environment, experience or engagement, it’s the emotion we CHOOSE that determines the way we behave and react. There’s always a choice. We’re never forced to react in a positive or negative way. We’re not forced to react at all actually, but we are by nature an expressive species. So let’s look at the choice. Perspective: Someone drives into the back of your car by accident, it’s not your fault, they made a mistake. How do you react? Reaction 1. You’re already in a foul mood because you’re late to meet the girlfriend and you know you’ll get an earful for making her wait, again, and now to top it off you’ll be turning up having dented her car and you’ll have to waste even more time dealing with the inconsiderate idiot who couldn’t hit the brakes in time. So you kick off, you’re angry, you yell at the poor chap behind the steering wheel and a horrible negative energy emerges. He leaves feeling awful and guilty, and you arrive to meet the girlfriend dreading the inevitable argument that’s about to ensue. The next morning you receive news that you didn’t get the job you were banking on and yet another argument breaks out with the girlfriend, especially as now you can’t afford to repair the damage to her car. Reaction 2. You’ve had a great day, on your way to a lovely home cooked dinner, albeit a late one but it’s OK, she’ll understand, and you get a bump to the rear. You pull over and you both get out of your cars. The other chap is falling over himself to apologise, he’s distraught, he’s had a rough day, he lost his wife last month and he took his eyes off the road for a second and… bump. You nod, offer a smile, ask him if he has insurance, reassure him it’s OK and you swap insurance details. You feel sorry for the guy, he’s clearly been having a hard time and this is the last thing he needs. You take his business card and wish him well. Once home you take stock of the card and notice he’s the owner of the firm you just applied for a job with… *karma waves her magic wand*. The Opposite Perspective: Life is tough, you lost your wife last month, you’re lonely, getting old, and as if to make matters worse, you’ve accidentally bumped into the back of someone’s car. How do you react? Reaction 1: You pull over and begin to apologise but the driver of the other car isn’t interested in apologies or explanations, he just wants to let off steam, you patiently wait for him to finish his rant, offer your insurance details and continue the journey home trying to remind yourself that it was a genuine mistake, but his words rattle around your head and you begin to doubt yourself. Did you have one too many beers with lunch? Were you driving dangerously? Maybe you’re too old to be driving now? But how would you get to visit your grandkids if you couldn’t drive? What if you lost your license because of this? And the downward spiral of negative thought continues, draining you of all your energy and any capacity you have left to hang on to joy. Reaction 2: You pull over and begin to apologise profusely, you feel awful, you want this guy to know you’re not an idiot or a dangerous driver, it was a genuine mistake, you’ve been having a hard time, you tell him about your wife and he seems to be one of those rare decent human beings. He doesn’t get upset or angry and you take some relief and reassurance from his reaction to the bump. You swap details and continue the journey home. The next morning as you pass his business card to your assistant to sort the insurance, you recognise his name as someone who just applied for a job with your firm. You call him right away and offer him the job. Who doesn’t want positive people with compassion and integrity in their company?! Has the message has been delivered? There are two lessons to be learned from this story. Too often we allow the energies of others to affect us in negative and damaging ways, but, it’s never personal. The young man in the first scenario already had negative energy around him, thereby denying himself and others close to him a positive outcome. The older man then allowed this anger to seep past his already vulnerable energy barrier and consume his thoughts, forcing him into a negative spiral. Negative energy is toxic and contagious. But, as with all things in our immaculate universe, there is a ying to the yang. Positive energy is just as powerful. It can be intoxicating and equally as contagious. Do you remember how contagious giggling was in the classroom at school? Take the second reaction options as a perfect example. In choosing to react with compassion (a positive emotion), an even more positive outcome was delivered. Positivity and negativity are exponential. The more positive you are in life, the more positivity you attract, and the more abundant you become. The same applies to negativity. The more negative energy you apply to something, or someone, the more destruction and devastation will appear in your life. What people fail to remember is that we have a choice. We can choose our emotions. Next time you find yourself insulted, upset, or offended by another, remember that negative emotion you are feeling is because they have projected negativity into your stratosphere. Even more important is to remember that you are just as much to blame for your reaction at this point. You have ALLOWED that negativity into your personal energy space. If you are going to allow that, then frankly you deserve it. You have to take responsibility for yourself. There is, however, an easy way to avoid this in order to protect your perfect energy and retain your ‘chi’… just remember it’s never personal! Whatever negativity might be projected onto you, isn’t because of something you’ve created, it’s because of the opposing person, their personal issues, and what THEY have created. That has NOTHING to do with you. We too often get upset because we allow another persons issues to take a tole on our lives, our thoughts, and our emotions. No man is an island, but your headspace, SHOULD BE. The space inside your energy barrier, is yours. You decide what goes on behind your planetary rings. That’s your personal universe and nobody should be able to disrupt the internal balance. Walk through life aware of your aura. It’s your invisible shield of light, your universal protector, your sanctuary, and your safe place. It’s YOU. Invest in your sanity. It seems so obvious when it’s laid out in four simple words but it’s one of the most powerful tools we can use to successfully elevate our way through this thing we call ‘life’. It’s never personal. It’s just projected. Now will you take responsibility to protect?